On 29 November 1949, the Western Māori election was held. The winner, by 5871 votes, was Iriaka Rātana, who became New Zealand’s first female Māori MP. When she was in her late teens, Iriaka’s family visited a sick aunt at the home of Tahupōtiki Wiremu Rātana, leader of the Rātana movement and a faith healer. Although her family returned home, Iriaka stayed, becoming part of the haka, poi and waiata troupes that travelled with Rātana. Iriaka later married him; after his death in 1939, she married his son, Matiu Tahupōtiki Wiremu Rātana. Iriaka and Matiu moved to a farm at Whangaehu with their young family. In 1945, Matiu became MP for Western Māori, but died in a car accident four years later. Iriaka contested the seat not simply as the wife of the former MP, but as a powerful force in her own right. She was a strong figure in the Rātana movement, which held all the Māori seats at this time. 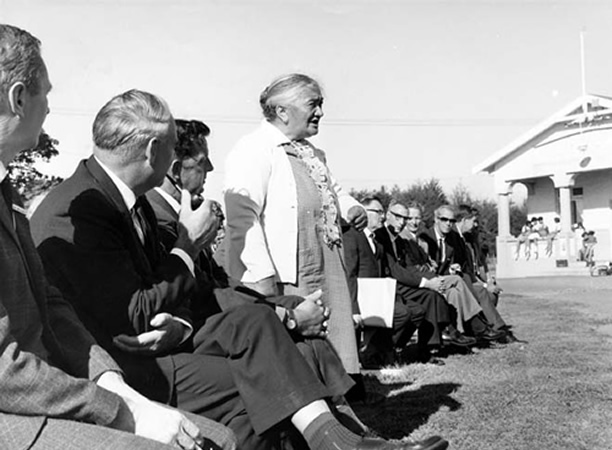 Such was Iriaka’s mana that when Labour (which had been in an alliance with Rātana since the 1930s) put forward a non-Rātana candidate, she threatened to run as a Rātana Independent and Labour backed down. Iriaka Rātana’s nomination and election were not without controversy within Māori society. Tainui leader Te Puea Hērangi had earlier declined to stand for Parliament on the grounds that no woman should ‘captain the Tainui waka’. Iriaka’s National opponent, Hoeroa Marumaru, stated that forcing a woman into a man’s position would be a break with Tainui protocol. Despite these criticisms, Iriaka Rātana won election by a wide margin and held Western Māori seat for 20 years before retiring in 1969. As an MP, she focused mainly on social issues such as housing for the elderly and recently urbanised Māori youth, education and training for Māori, and the redevelopment of Rātana Pā. We have 22 biographies, 6 articles, related to First female Māori MP elected.